This article is one in a series that have been released in conjunction with Wayne's new book, 101 Performance Projects for Your BMW 3 Series. The book contains 272 pages of full color projects detailing everything from performance mods to timing the camshafts. With more than 650+ full-color glossy photos accompanying extensive step-by-step procedures, this book is required reading in any 3 Series owner's collection. The book was released in August 2006, and is available for ordering now. See The Official Book Website for more details. In-between the transmission output shaft and the driveshaft, there is a flexible coupler that joins the two together. This rubber, reinforced coupler isolates vibration from the rest of the drivetrain, while transferring power from the engine and transmission to the rear differential and wheels. As the car ages, and is exposed to the elements, these discs (or guibos, as they are sometimes called) develop cracks and begin to disintegrate. The rubber shell is reinforced with rope cords on the inside, and it is not uncommon to see one completely fall apart with the cords flying everywhere. I recommend inspecting this rubber joint about every 10,000 miles or so (about once a year) to make sure that it still looks okay. If it fails, it does have the potential to leave you stranded. Replacement is not too difficult, but it does require that you take a few things apart to reach the flex disc. Begin by raising the car off of the ground and supporting it on jack stands. See the Pelican Technical Article on Jacking Up for more information. The next step is to remove the muffler and catalytic converter. 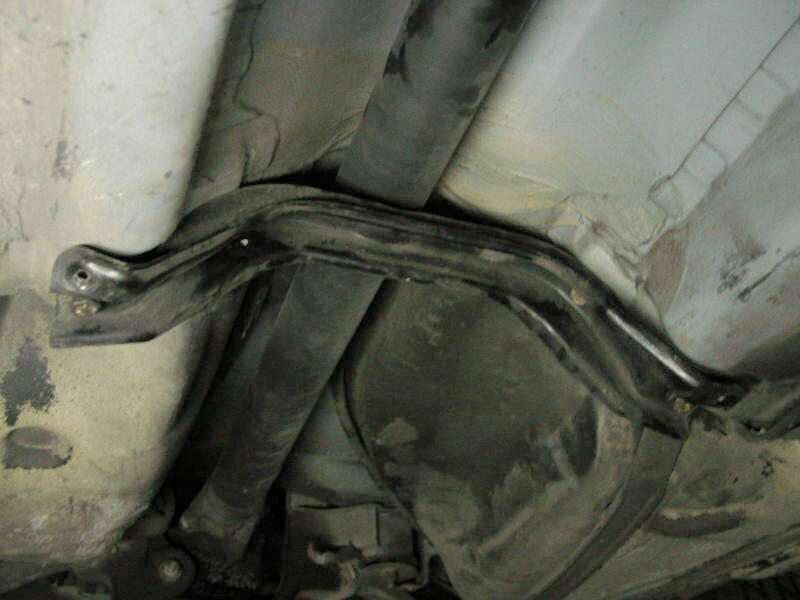 I have found that it is best to disconnect the entire rear exhaust system from the forward flange and drop it as a single unit. This actually sounds a lot harder than it really is - disconnecting the exhaust is really quite easy. See the Pelican Technical Article on Muffler Replacement for more details. 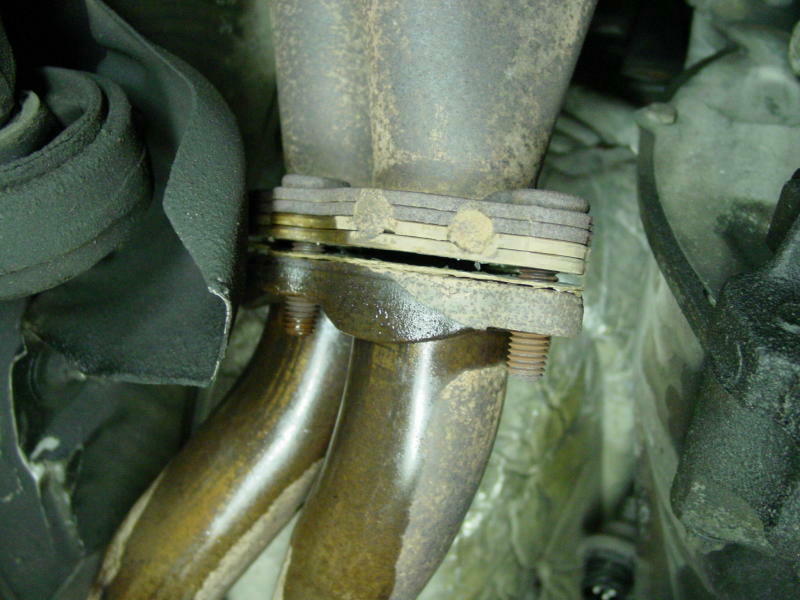 Begin by unfastening the small exhaust retainer clamp from the bottom of the transmission. 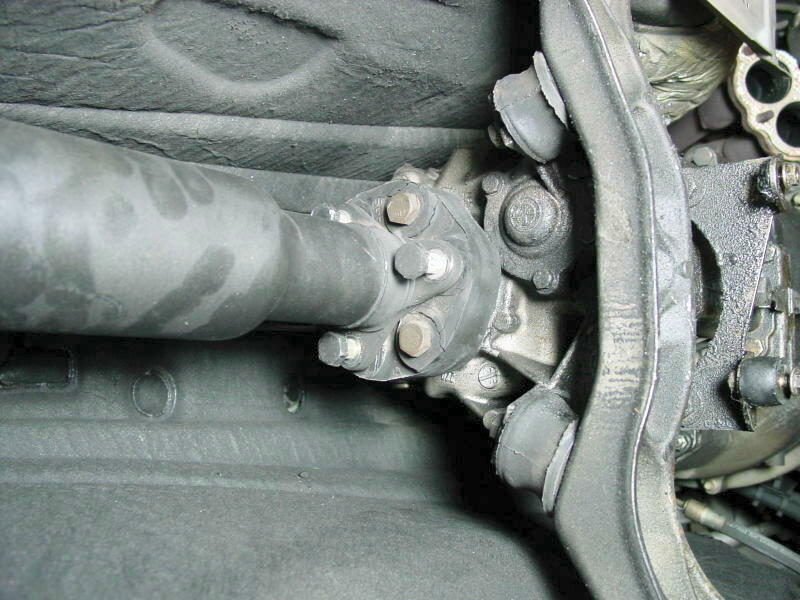 Figure 1 shows the underside of the car with the small exhaust retainer bracket disconnected from the transmission. Figure 2 shows a close up of the disconnected clamp. 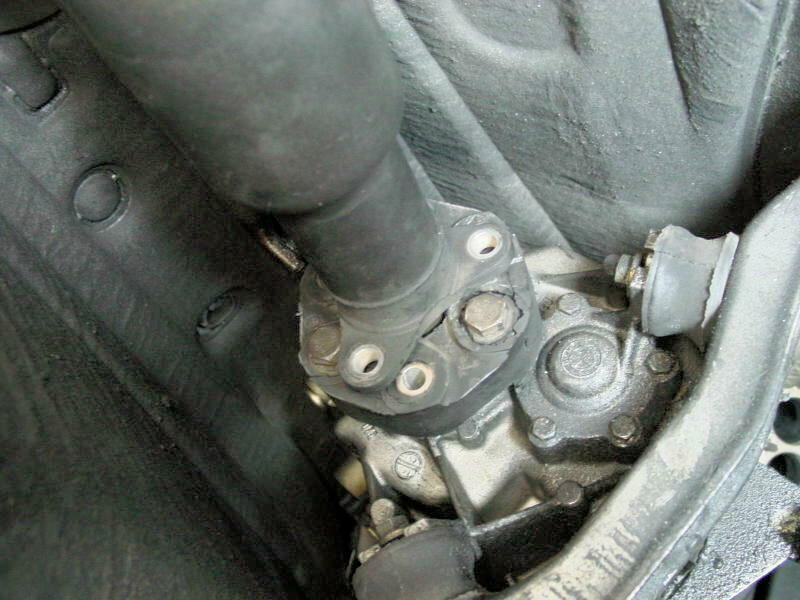 Then, remove the six bolts from the exhaust flanges near the front of the transmission (Figure 3). You may want to use some WD-40 or other penetrant on the bolts before you attempt to remove them. 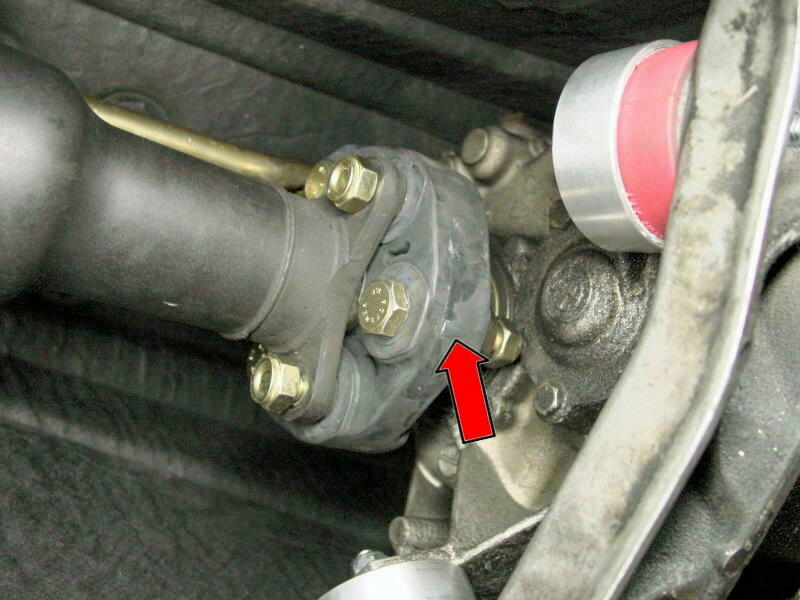 If you have a later-model BMW, disconnect any oxygen sensor wires that may be attached to the exhaust pipes. 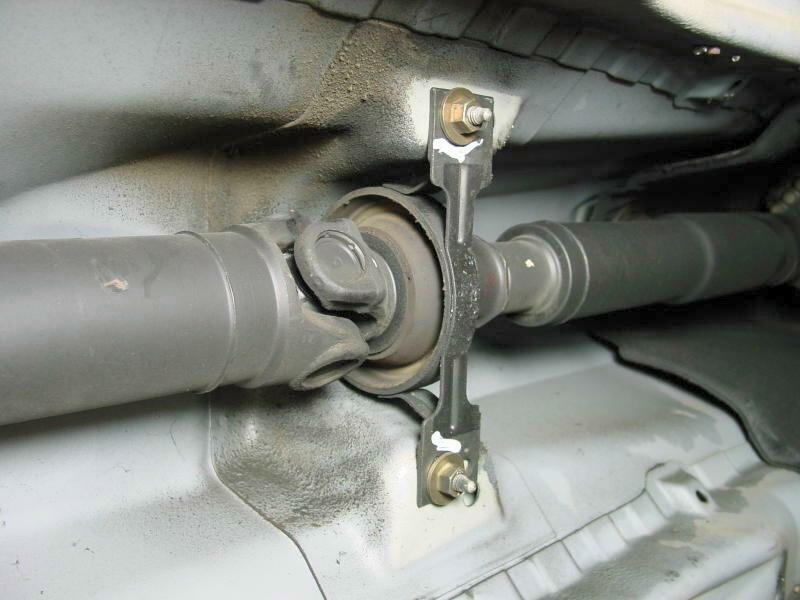 Now you should be able to undo the rear muffler clamps and drop the entire muffler/catalytic converter assembly. Be aware though - this whole assembly weighs about 50 lbs, so exercise caution as you loosen clamps and bolts, and drop the entire system down. With the exhaust removed and out of the way, remove the light heat shield that covers and protects the underside of the car. This heat shield is made out of an aluminum-foil type of material and can be easily unfastened from the underside of the chassis. Although not 100% necessary, I recommend removing the lower transmission support bar at this stage - it will make access to the flex disc a lot easier (Figure 4). See the Pelican Technical Article on Replacing your Transmission Mounts for more details. 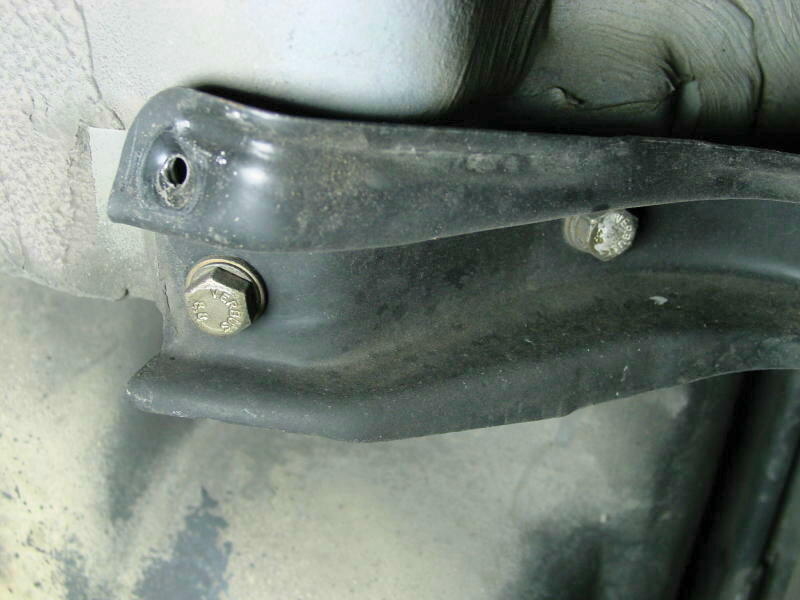 By the way, it's also a great time to replace your transmission mounts while you have easy access to this area. 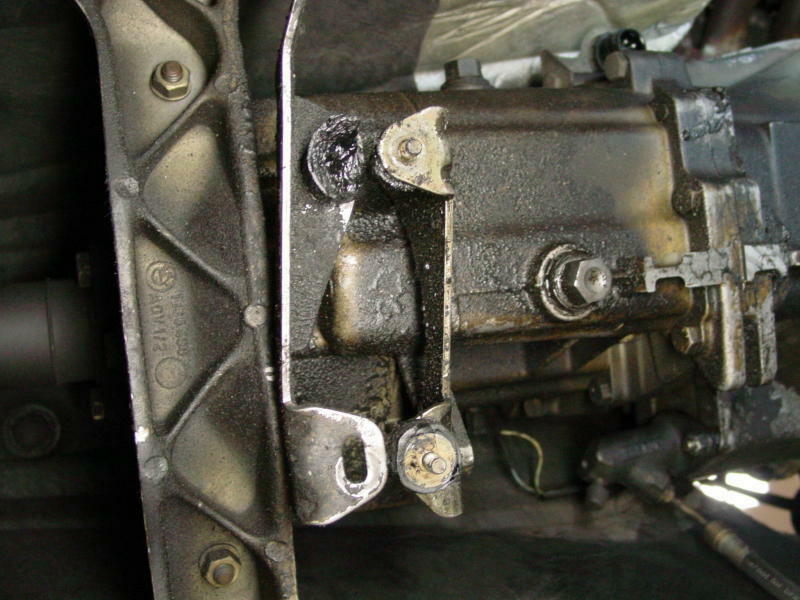 Using some paint or white-out, mark the transmission output flange and the driveshaft to clearly indicate which flanges connect to each other when you reassemble the unit. Place a mark at the point indicated by the arrow in Figure 5, and also another mark in the same place on the opposite side of the flex disc. This will help you align the driveshaft with the transmission output flange later on. 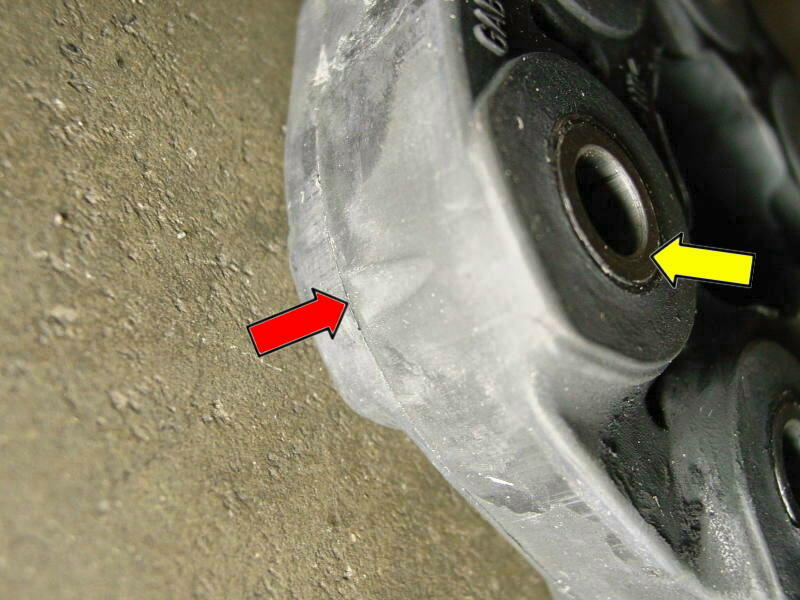 Also in Figure 5, you can begin to see the flex disc start to fail - small surface cracks have appeared in the rubber. Now, remove the bolts from the flex disc (Figure 6). There should be six total, and they all might not be very easy to get to. You will need a deep socket and open-ended wrench in order to get to them. You will also need to rotate and lock the driveshaft as you work. 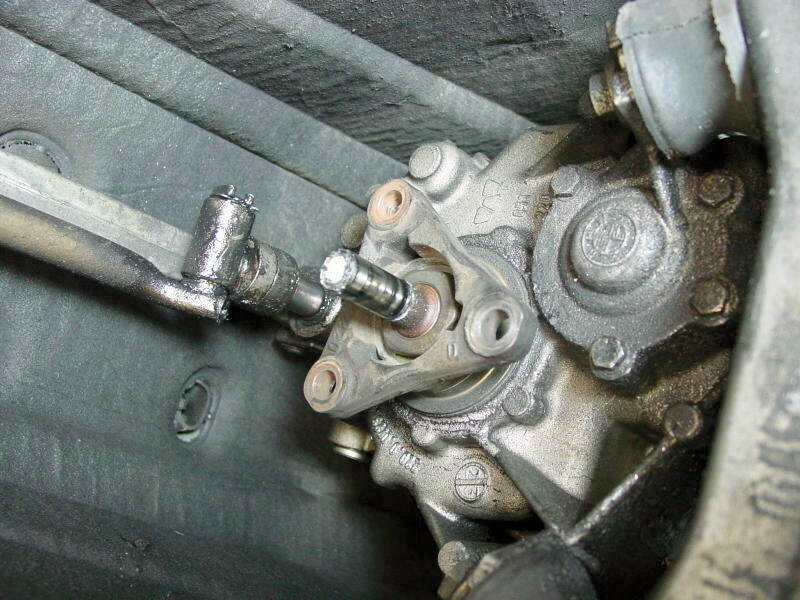 Release the parking brake and take the transmission out of gear, then use your hand to rotate the driveshaft so that you can reach the bolts and their corresponding nuts, and then re-engage the parking brake. You will have to rotate the driveshaft three or four times in order to remove all of the bolts. Now, turn your attention to the rear end of the tunnel. Remove the small cross-brace that spans the driveshaft tunnel (Figure 7 and Figure 8). This will allow you to drop down the driveshaft and remove it from the transmission flange. 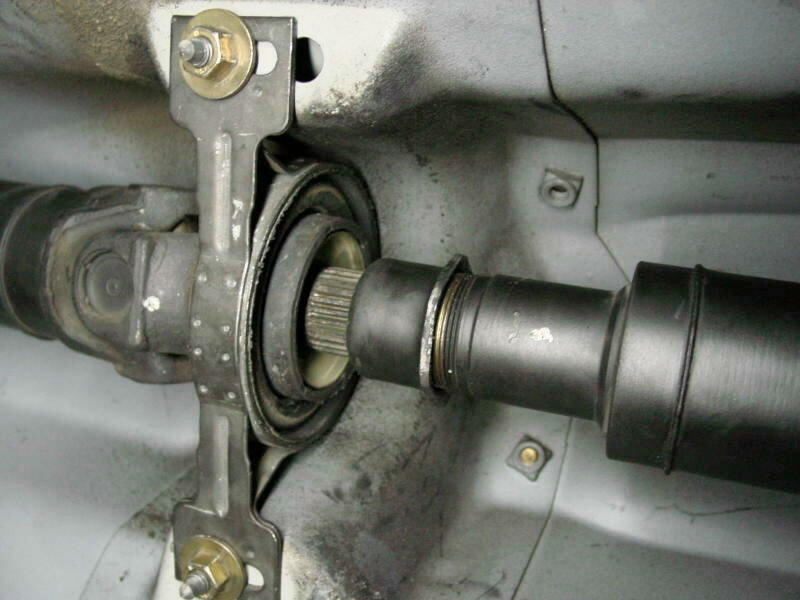 Turn your attention to the rear driveshaft bearing (Figure 9). 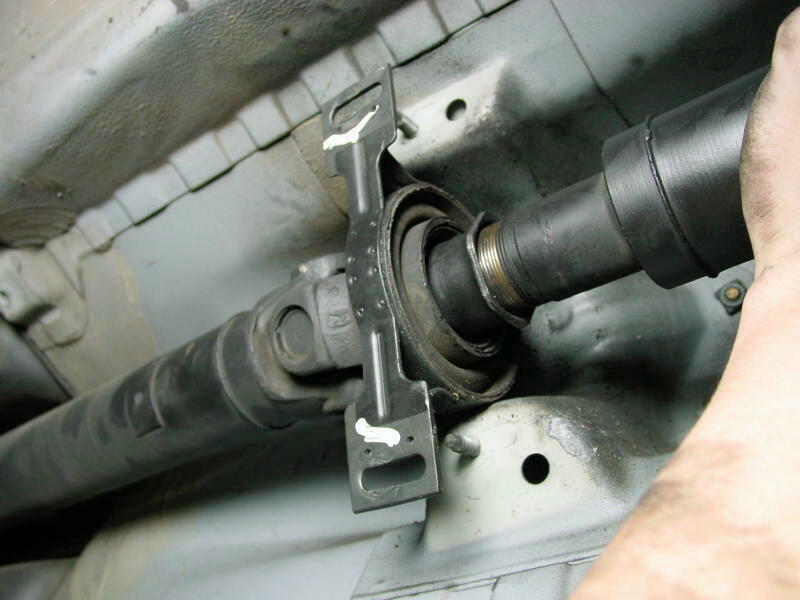 Remove the two nuts that secure the bearing to the chassis (Figure 10), while holding up the driveshaft with one hand. When the nuts are removed, you should be able to drop down the driveshaft and remove the shaft from the transmission output flange. Support the driveshaft using a jack stand. 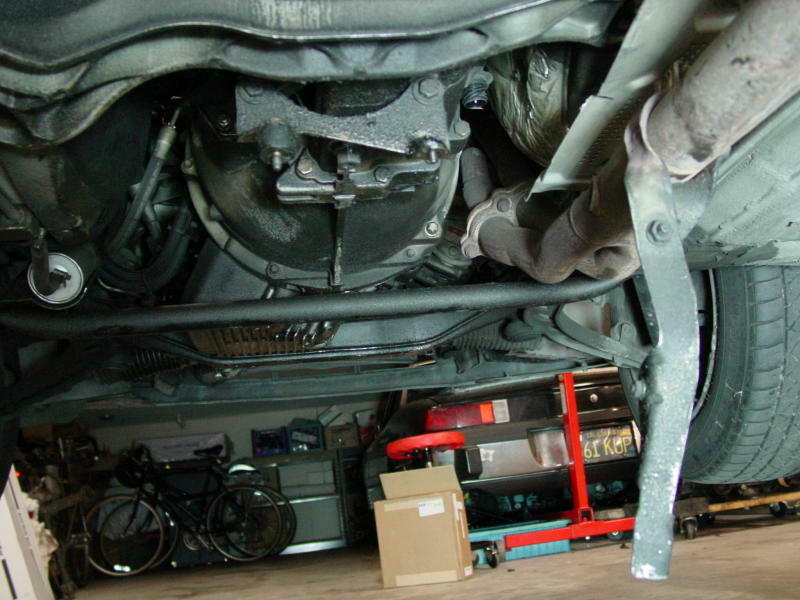 On some cars, you may need to completely disconnect the center driveshaft in order to remove the flex disc. If you can't seem to get enough clearance to remove the flex disc, then follow the procedures in our Pelican Technical Article: Rear Driveshaft Bearing Replacement. Figure 11 shows the transmission output flange with the flex disc removed. Now that you have access to the flex disc, completely remove it from the driveshaft. Figure 12 shows a flex disc that is getting very close to failure. Since you have access to this area, now would be an excellent time to replace and replenish your shift bushings, or to install a short shift kit. Figure 13 shows a brand new flex disc along with new mounting hardware. For important parts like these, I always try to use new hardware. BMW recommends replacing the self-locking nuts, but I also like to replace the bolts if they happen to look like they have become slightly corroded. Take your new flex disc and attach it onto the driveshaft. If you look closely at Figure 14, you will see that the flex disc has an arrow that is cast into the side of the rubber disc. This arrow points towards where the flanges are to be mounted. 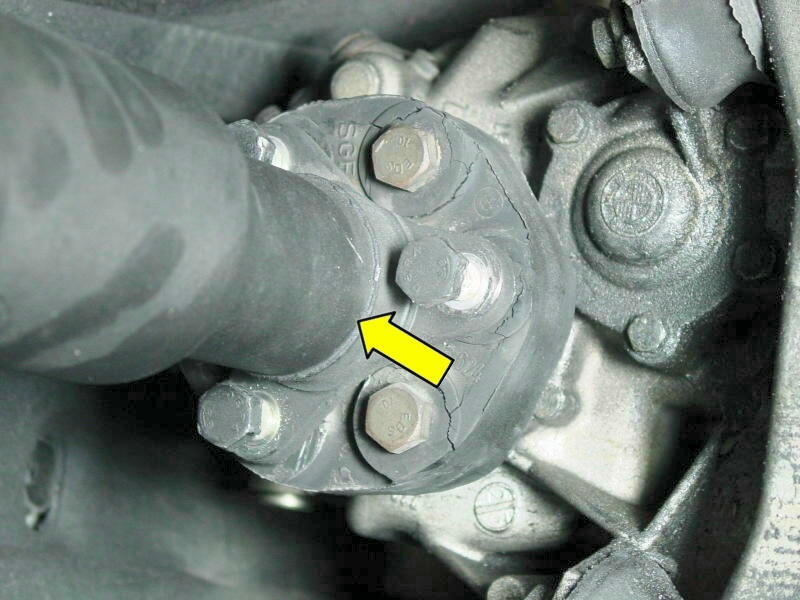 In other words, the transmission or driveshaft flange will mate against the surface shown with the yellow arrow. The rule of thumb is that the arrow shows which way the mounting bolts are pushed through the flex disc. Torque the bolts onto the driveshaft first, but only if you have enough clearance to get the entire assembly back into the transmission output flange. Then, move the rubber disc back up to the transmission flange and insert the remaining three bolts, as shown in Figure 15. Be sure to align the white mark you made on the driveshaft back up with the matching mark you made on the transmission output flange. This figure also shows the arrow on the rubber flex disc, in this case clearly pointing towards the transmission output flange. 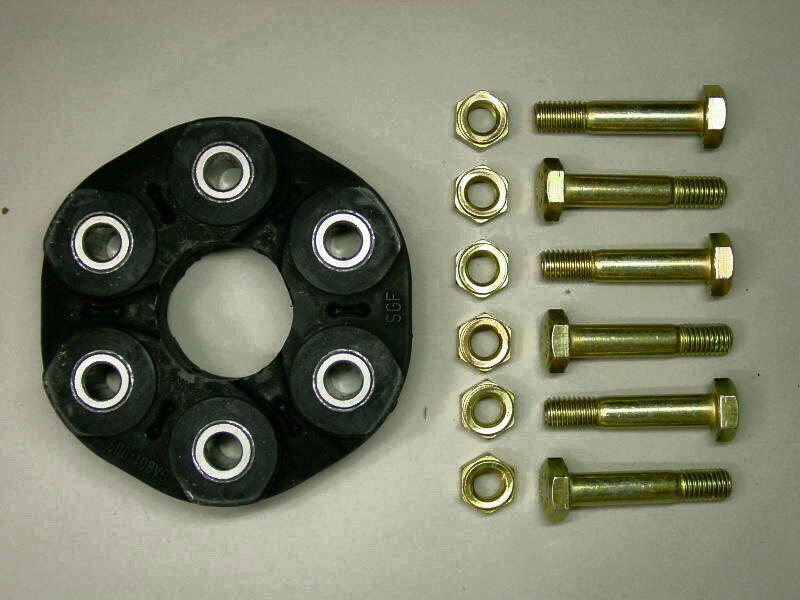 With the flex disc bolts loosely connected, reattach the rear driveshaft bearing. Push it towards the front of the car as you tighten it down - you want the bearing to have no slack on the rearward side (Figure 16). When the bearing is reattached, then tighten up the bolts on the flex disc. 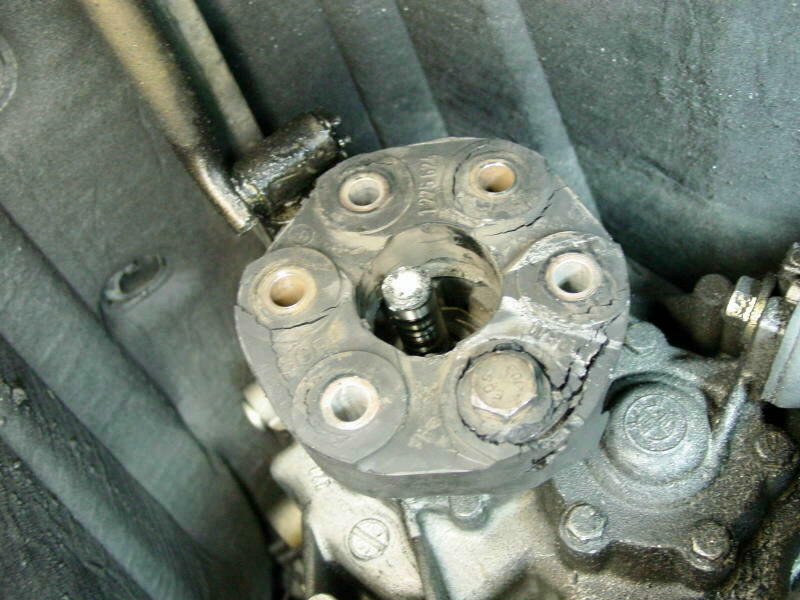 To complete the job, reattach the heat shield, the exhaust system, and any oxygen sensor connectors you may have disconnected. If you would like to see more technical articles like this one, please continue to support Pelican Parts with all your parts needs. If you like what you see here, then please visit our online BMW catalog and help support the collection and creating of new and informative technical articles like this one. Your continued support directly affects the expansion and existence of this site and technical articles like this one. As always, if you have any questions or comments about this helpful article, please drop us a line. This technical article is made possible solely through the support of Pelican Parts. If you like what you see here, then please visit our online BMW catalog and help support the collection and creating of new and informative technical articles like this one.